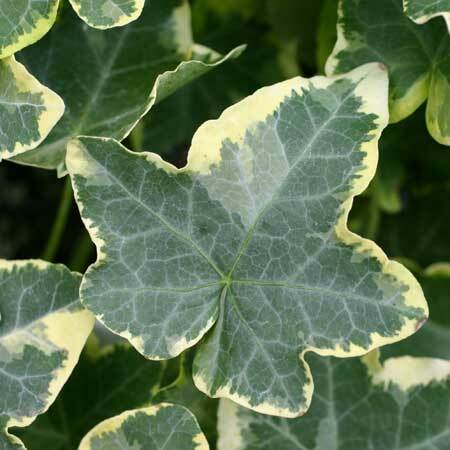 Hedera helix 'Gilded Hawke' (V, C) This Beautiful ivy discovered by Gillia Hawke and named in her honor, has large leave: three to five lobes that curl downward. Viens raised with some puckering of the leaf surface. 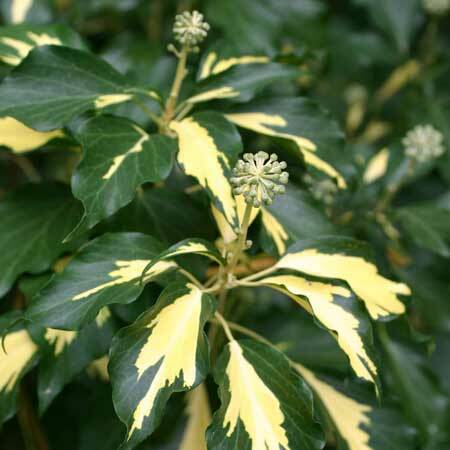 Color gold to yellow margin which can fade to cream in hot temperatures, with a green and gray center. Makes long runners. 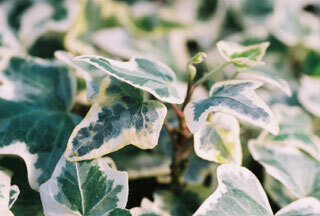 Hedera helix 'Glacier' (V, I) One of the oldest silver-gray, variegated ivies. Three-to-five-lobed, with basal lobes mere projections. 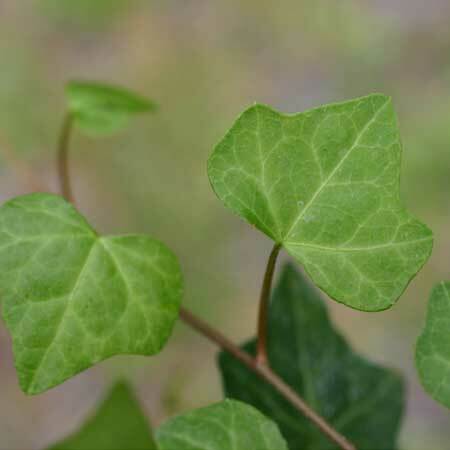 Shallow sinuses make the leaf look triangular, with a heart-shaped base. Color gray-green with silver gray and cream edge. 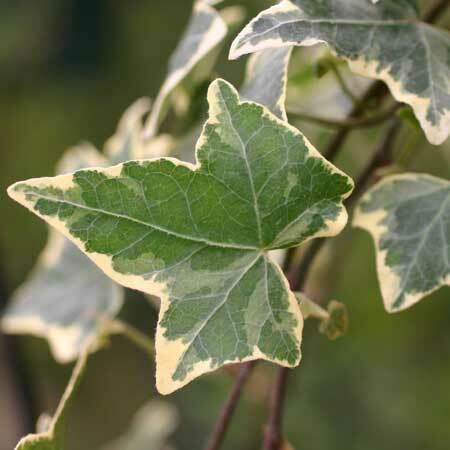 Hedera helix 'Gold Finch' Gold to lime green three to five pointed lobed leaves, bushy habit. 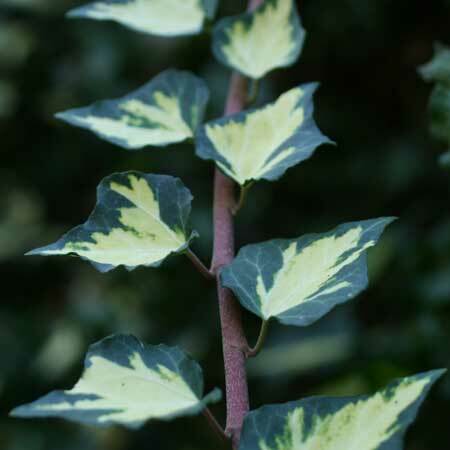 Hedera helix 'Gold Heart' (V, I) Leaves small, widely spaced on pink to maroon stems, with bright yellow-blotched center and wide green border. Cental gold color constant; only the intensity varies with the environment. 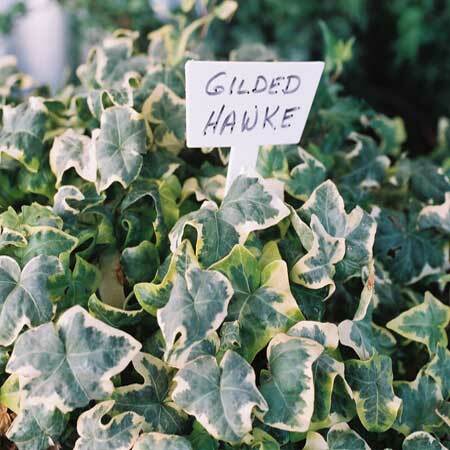 Hedera helix 'Golden Girl' (C) Most attractive medium sized, 5 lobed leaf with gold margins and a slightly crinkled edge. 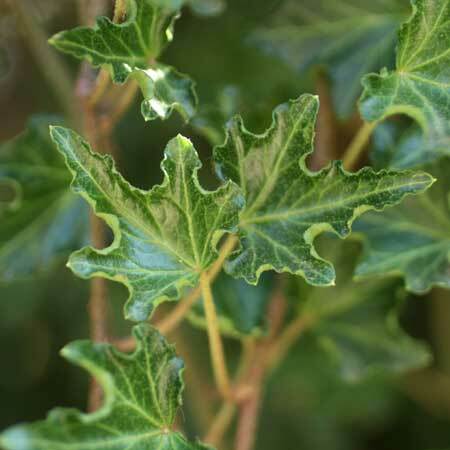 Hedera helix 'Golden Snow' (V, I) Leaves small to medium-sized, basically five-lobed, about as long as wide, with a cream to white margin and a green to gray-streaked center. 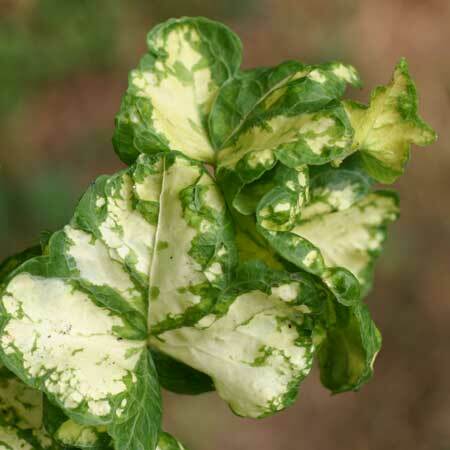 The creamy-white border is widest at the leaf base and in the sinuses ("valleys") between the lobes. 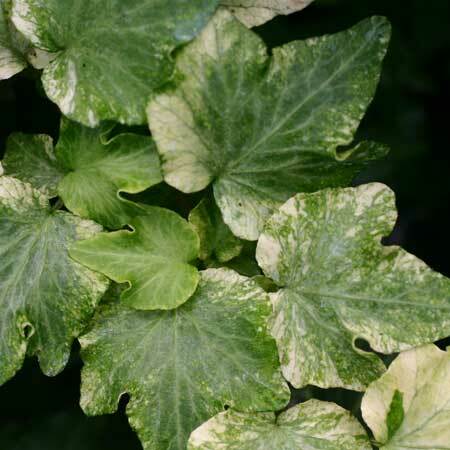 The border is irregularly blotched with pale lemon-yellow, giving the plant an overall lemon-yellow tint. 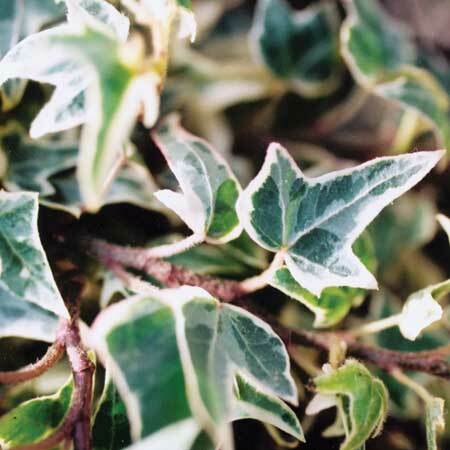 Hedera helix 'Iantha' (M, BF) One of the smallest plants. 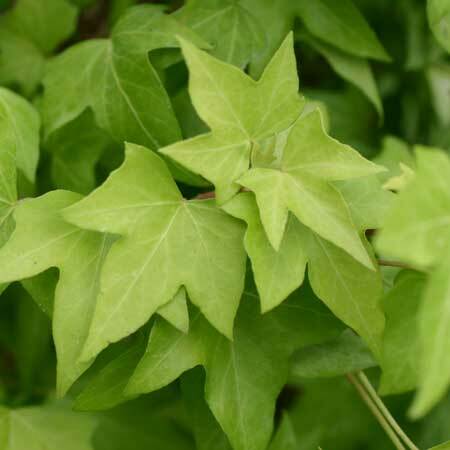 Hedera helix 'Ivalace' (C, M) Very lustrous, small dark green leaves with margins curled upward. 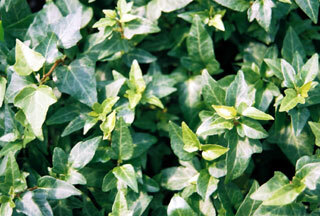 Hedera helix 'Kobold' (M, BF) Smaller leaf sport of 'Wichtel'. 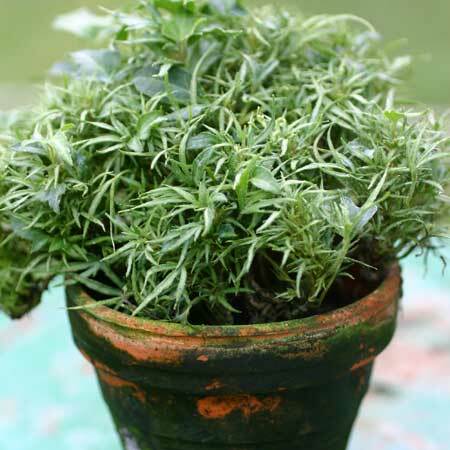 Small, medium-green, mostly unlobed leaves with a rounded-tipped, elongated terminal lobe, or slightly three-lobed with asymmetrical basal protrusions. A distinctive, slight pucker is at base of blade. 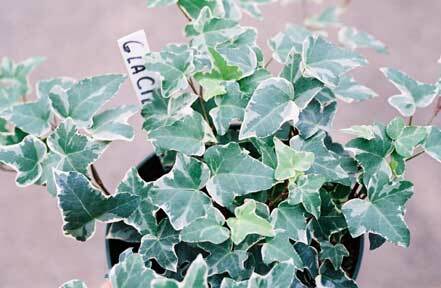 Hedera helix 'Lady Frances' (M, V, BF) Miniature gray and white variegated Bird's Foot ivy. 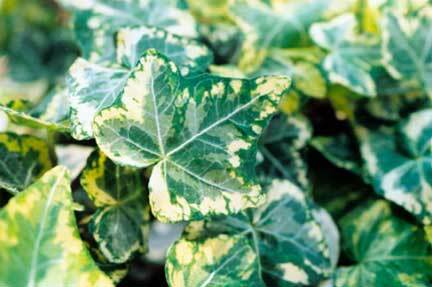 Variegation is constant. Leaves small, asymmetrical, sharply pointed, predominantly three-lobed with lateral lobes pointing outward, or leaves barely five-lobed with a suspicion of basal lobes. Strongly self-branching.